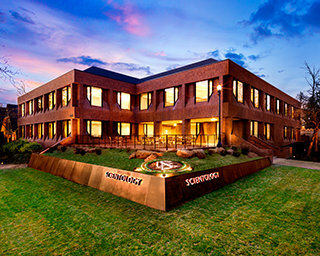 The Church of Scientology of Salt Lake City’s gracious new 43,000-square-foot facility, stands in the heart of the city in honor of an undying commitment to the betterment of Utah. RECEPTION Open seven days a week, morning to night, the Church of Scientology of Salt Lake City welcomes anyone wishing to obtain an introduction to Dianetics and Scientology. INTRODUCTORY SERVICES The Church of Scientology Salt Lake City provides for the delivery of all Introductory Services. These include evening and weekend Dianetics and Scientology seminars, imparting an overview of fundamental principles and their application for living. Among the many services available at the Church of Scientology Salt Lake City is an entire array of Scientology Life Improvement Courses to help better any aspect of one’s life. DIANETICS & SCIENTOLOGY BOOKSTORE The Church of Scientology Salt Lake City makes available L. Ron Hubbard’s works on Dianetics and Scientology. In all, Mr. Hubbard’s legacy comprises tens of millions of published words in dozens of books and thousands of recorded lectures. Materials are available in 50 languages. THE PURIFICATION CENTER Scientology Founder L. Ron Hubbard developed the Purification Program to free individuals from the mental and spiritual damage caused by drugs and toxins, through a regimen of exercise, sauna and nutrition—all of which are provided for in the Purification Center. The mural pays tribute to picturesque majestic mountains the city is known for. Each of Salt Lake City’s auditing rooms is ideally appointed to provide the calm, distraction-free setting requisite to achieving spiritual enlightenment, reflective of the pristine air and mountain settings the city offers. THE ACADEMY The Academy is where Scientologists train to become auditors (spiritual counselors), capable of applying the technology of auditing to help others attain spiritual freedom. The Salt Lake City Academy comprises multiple course rooms, each devoted to a different aspect of training. THE PEAKS CAFÉ The Café welcomes visitors touring the Church and provides a gathering place for those attending the many scheduled events. It is further provided for parishioners during breaks in their Scientology services. THE CHAPEL The Chapel, lined with the Codes and Creed of the Church of Scientology, provides for all congregational ceremonies and services—including Sunday Services, Weddings and Naming Ceremonies. The Chapel also serves as an ideal venue for workshops, banquets and events in the name of community collaboration for the betterment of Salt Lake City. To that end, we share our Church and our many social betterment and humanitarian programs with all of Salt Lake Valley. 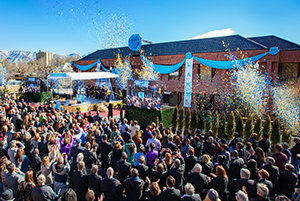 In a city whose name itself carries for all Americans connotations of religious faith and commitment, the Church of Scientology Salt Lake City today, February 17, dedicated its newest addition to an ever-expanding congregation of churches worldwide. On a balmy Saturday under bright sun—uncommon for midwinter in this picturesque mountain city—the Church was welcomed by civic and religious leaders who joined local and regional members to officially open its new home in Utah, just a mile from the heart of Salt Lake. While the weather in Salt Lake in February typically stays below freezing, the warmth of welcome at this grand opening was typical of the descendants of the city’s pioneers, whose belief in respect for individual liberties continues to run like an undercurrent within the community.